Garden pests and critters that eat away at your hard-earned vegetables and flowers can frustrate even the most patient of gardeners. 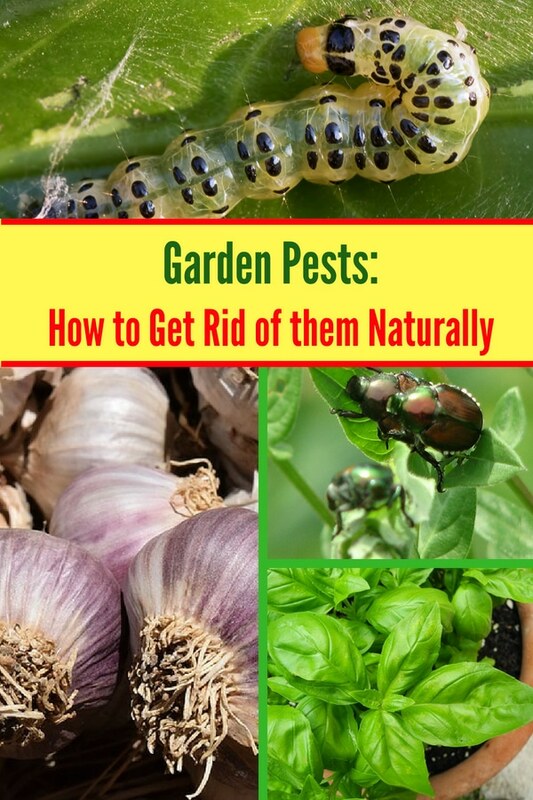 The fact of the matter is, if you want a thriving garden, you need to learn how to effectively eliminate garden pests, even if the very thought of them makes you squirm! Reaching for a chemical-laced pesticide, however, is NOT the answer. While pesticides might kill the pests that are driving you crazy, they’ll also kill the good bugs that actually protect your plants. They’re also terrible for the environment and our ecosystem, so pesticides should be avoided at all costs. 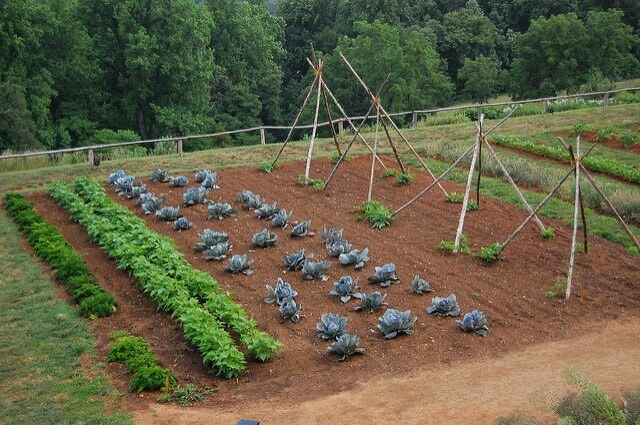 If you’ve worked this hard to grow your own organic garden, then getting rid of pests as naturally as possible is the best solution. My guess is you wouldn’t want to spray your home-grown vegetables with harmful and environmentally-toxic chemicals! 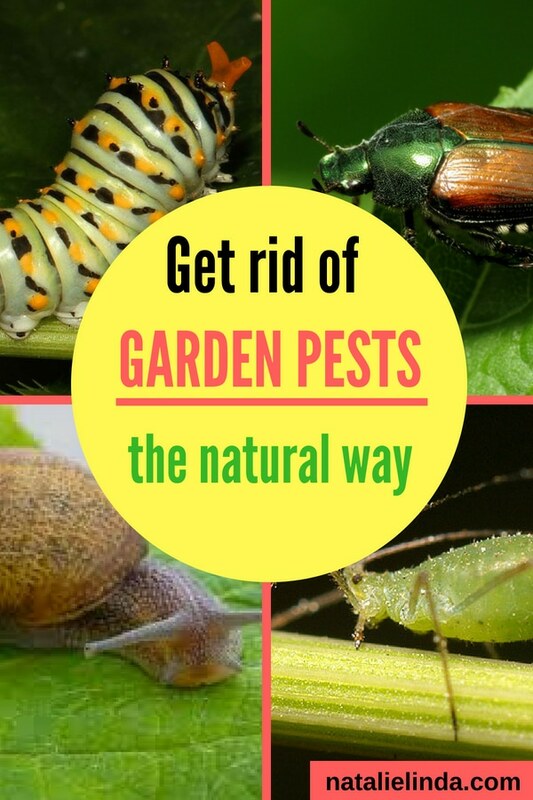 Fortunately, there are various tried & true non-toxic methods for getting rid of insects that eat away at gardens, so pick a few that you’re most comfortable with and make them a part of your gardening routine. The best way to keep garden pests from overtaking your garden is to PREVENT them from coming in in the first place. How can you do this? By keeping your soil healthy and keeping your garden clear of dead leaves and weeds. Insects don’t gorge on healthy plants, so keeping out decay and fungus is the best deterrent. As soon as you see evidence of garden pests on your plants (like holes in your leaves) it’s time to do some work to bring your plants back to health. That’s when you should reach for a microbial inoculent and a liquid seaweed fertilizer. This will help bring nutrients back to the soil and plants and thus eliminate bugs. Watering your plants early in the morning is good for several reasons: it’ll help keep your water bill low, it’ll help with the photosynthesis process, and it’ll give your plants’ foliage the opportunity to dry off under the day’s sun and thus keep moisture-thriving fungus and insects at bay. This is particularly important for avoiding slugs, who thrive in cool and moist conditions. If you see several holes in the leaves of your plants, then you have a slug problem. 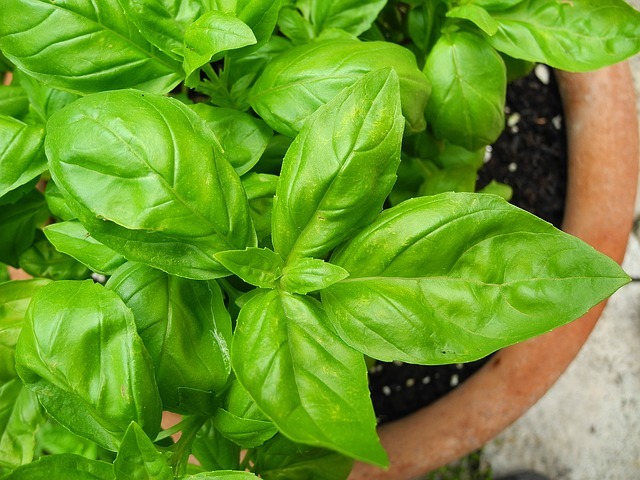 Herbs that let out a strong odor such as basil, mint, and chives, actually repel aphids. Aphids are one of the worst garden offenders and they love to feed off sap while leaving behind their saliva. Yuck! Grow these herbs near other plants to keep aphids from settling in. Think of this method as smart companion planting. Lots of insects are actually beneficial to gardens. They feast on the “bad bugs” and make our life as gardeners much easier. These good insects include ladybugs, praying mantises, and wasps who love to eat aphids, mites, and the larvae that are left behind on the leaves. You can purchase ladybugs at some garden centers, or you could simply try planting pollen-producing plants in your garden that attract them. These plants include Calendula, Cilantro, Chives, Cosmos, Marigolds, Sweet Alyssum, Yarrow, Fennel, and Dill. Luckily, many of these herbs are easy to grow, and the aforementioned bug-repelling flowers are either low-maintenance perennials or gorgeous annuals that will beautify your garden all Summer long and into Fall. It’s a win-win! This DIY spray is an excellent way to help your plants hold up against bugs and fungal disease. Mix 1 tablespoon of vegetable oil, 2 tablespoons of baking soda, and a bit of Ivory liquid soap into a gallon of water. Place the solution into a spray bottle and spray it onto your plants.
. It’s a strong and effective natural solution that can eliminate all kinds of insects including common culprits like caterpillars, aphids, beetles, locusts, and ants. It’s also safe to use on vegetable plants and doesn’t disrupt the soil. To learn more about how neem oil does its job so well, check out this eye-opening post by the Smiling Gardener. It’ll change the way you understand organic gardening. Slugs are notorious for eating away at vegetable gardens, so you’ll definitely want to get rid of them asap. While you might not see them during the day, they love to come out at night to feast on your plants. So what’s a natural solution? Beer! Slugs are attracted to ale, so place a bowl of beer next to your garden. The slugs won’t be able to resist the ale and they’ll crawl straight into the bowl. Discard the beer and slugs in the morning. (which has a reputation for being a gentle and natural soap). Spray the solution onto the leaves of your plant. This method works very well. Try mixing 5 tablespoons of Ivory soap into 1 gallon of water for a good supply. 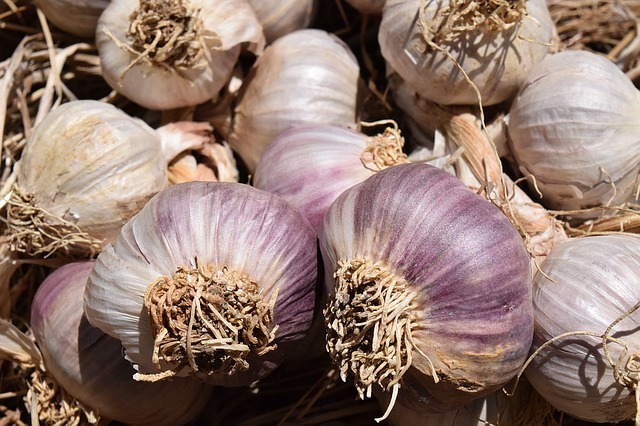 Garlic is another excellent bug repellent that will keep bugs off your plants and get rid of the ones that have already made their way into your garden. Garden insects hate the smell of garlic! Simply mix a whole head of garlic (or two) and puree it with water. Let it sit overnight and then strain out the liquid in the morning. Pour it into a spray bottle along with water and a drop of Ivory dish soap. Then, spray away at your leaves! is a good way to kill soft-bodied bugs like caterpillars, slugs, and aphids; the sharp particles will get rid of your bugs mechanically when the bugs crawl over them. Simply sprinkle some of the particles over and around your plants and the slugs won’t stand a chance! That concludes this list of how to make sure garden pests don’t overtake your garden. Once you try a few of these solutions, you’ll see that reaching for a pesticide is unnecessary. Natural insecticides that you can make at home with household items are both gentle on your plants and effective against the worst garden pests!